Boy was I on fire when I recorded this video! I shot this about three months ago, after having two conversations with clients that got me all flushed about email marketing. I turned on the camera and my passion oozed out. I get frustrated when clients explain that a school / nonprofit policy states they can’t send out more than one or two emails a month. Or that they have to promote the auction in a section of the existing newsletter. It kills me inside to know that they are hurting their auction potential. You know why I am a strong advocate of email marketing? National data proves it works for nonprofits – you’ll learn all about it in this product training. My own client data proves it works – you’ll see the results in this product training. Personal experience. Email marketing works for me every week. Even in this day and age when we’re inundated with emails and can’t hit delete quickly enough, email marketing works. Each time I send out an email, something positive happens for my business. An existing client wants to chat about an idea. My shopping cart alerts me to new sales. Some people unsubscribe, but many don’t leave without saying goodbye. “I’m retiring but have loved the newsletter,” one wrote, or “Auctions aren’t part of what I do anymore, but keep up the good work helping nonprofits!” On occasion I’ll get a curt “too many emails,” but that’s rare. And the greater irony is that more people subscribe to my newsletter than unsubscribe each issue. Usually ~+10. This is why I love email marketing. And it will work for you and your auction fundraiser, benefiting you in ways you can’t even begin to imagine. But do it correctly. I want you to avoid that sharp pain of unsubscribes. In my master class on Marketing Your Auction, you see auction-specific examples. View dozens of good and bad uninspiring inane not-so-compelling email examples from real nonprofits advertising their upcoming auctions. Trust me — you will instantly understand how to do it right once you see examples side-by-side. Model what works. Learn how to rewrite real-life subject lines for higher open rates. Bonus: A timeline-creator marketing calendar. Pop in your auction date, and the auto-generated calendar spits out dates for marketing emails. One of the neat things about well-written emails is I’ve seen emails talk about the weather, a sale at a department store, or tell a bad joke, and those emails still get people to take action on your auction. 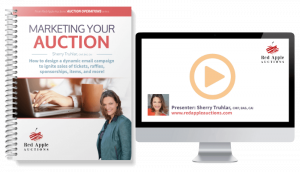 I’ve built my own business around email marketing and have collected oodles of auction-specific examples to help you get this right. Learn more about Marketing Your Auction here.